Easier to use and more precise with the new Smart Noozle. Lift the long applicator to use the product more precisely or lower it down to use it as a aerosol. Construction of the valve allows to use the spray independently of the position of can. 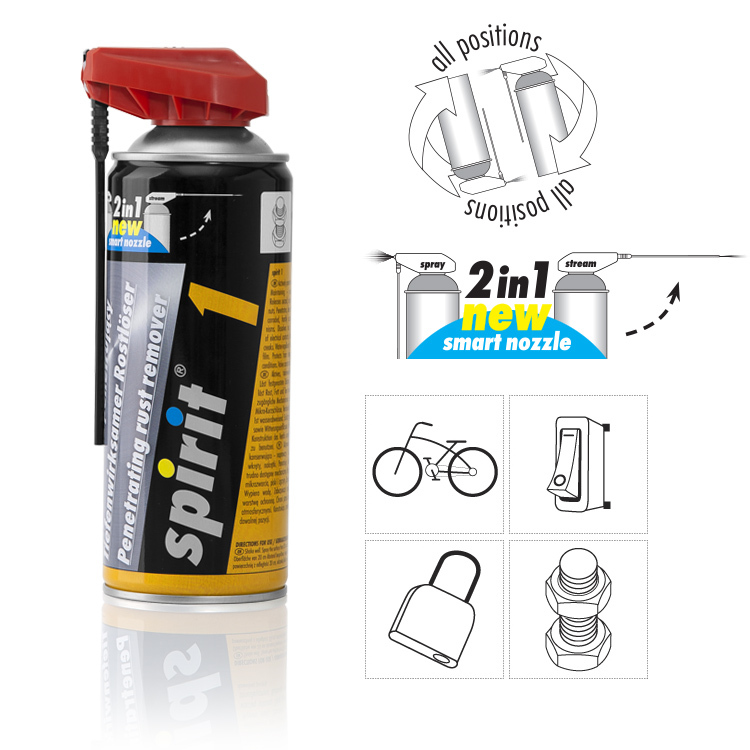 Spirit 1 is an universal maintaining - repairing agent. It releases screws and nuts. Penetrates, derusts and protects corroded, hard accessible mechanisms. It winds up squeaks and creaks. Dissolves rust, grease and tar. Eliminates micro - shortings. It prevents from electric contacts oxidation, water - repellent and protects from freezing. 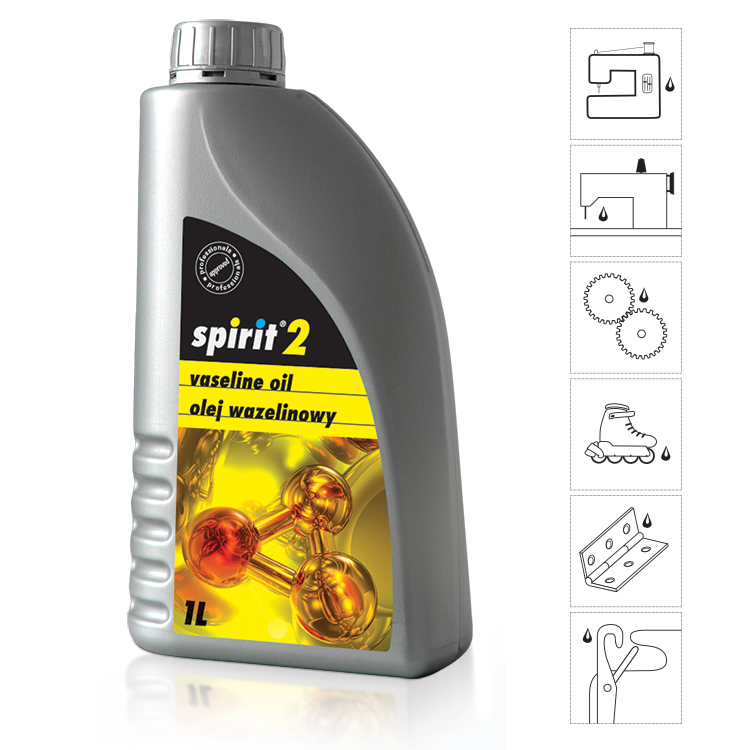 Spirit 2 is an universal, non toxic, non staining, odourless and colourless oil used for lubricating precision mechanisms. 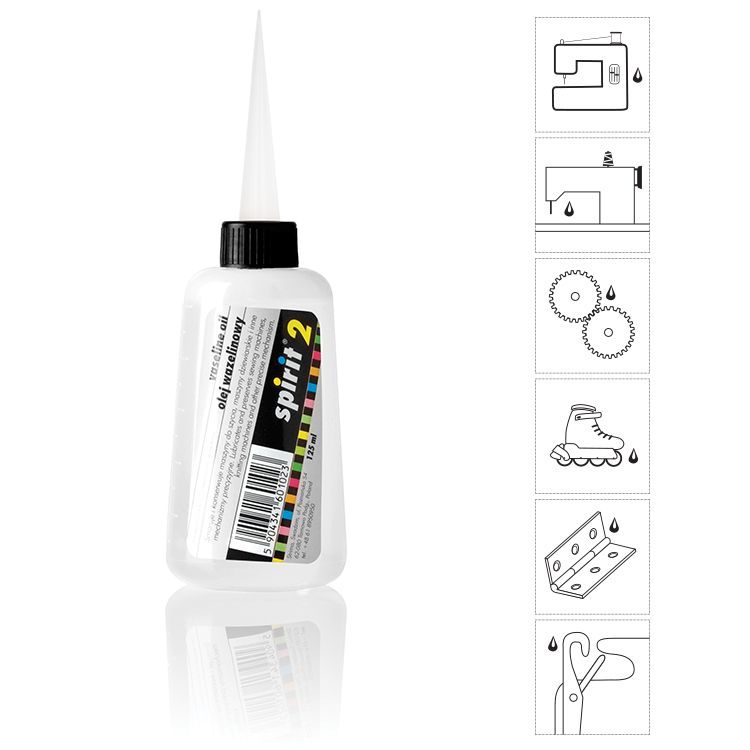 Especially recommended for lubricating parts of sewing, knitting and other machines used in textile industry. Neutral for plastic. Recommended as agent facilitating slide and protecting from sticking of plastic and gum products in moulds. 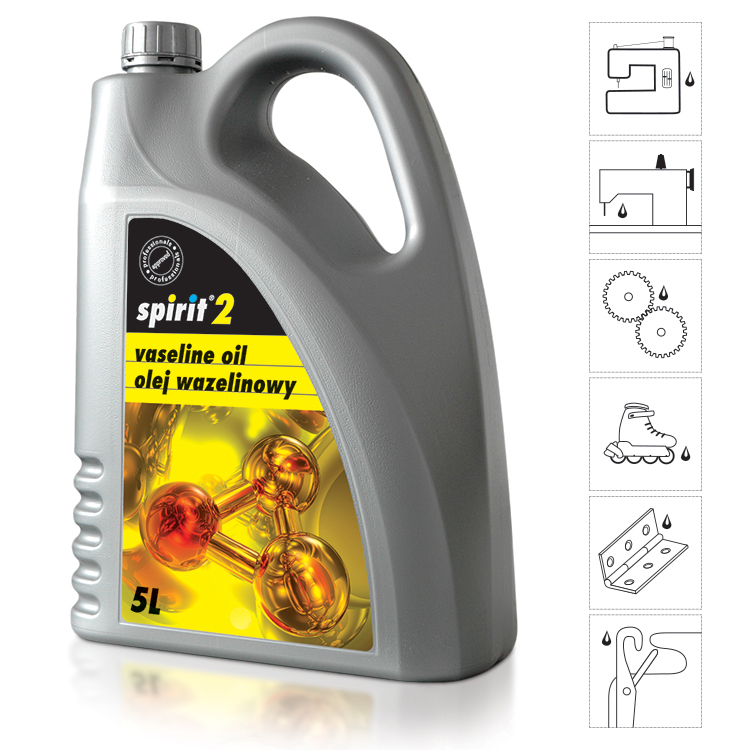 SPIRIT 2 is a non-toxic, non-staining, odourless, colourless oil, neutral for plastics. Perfect for punctual lubrication and conservation of household and industrial sewing machines (lockstitch, overlock, interlock, etc. ), needles, knitting cams and other precise mechanism in the textile industry. Handy, transparent lubricator can easily reach inaccessible places. 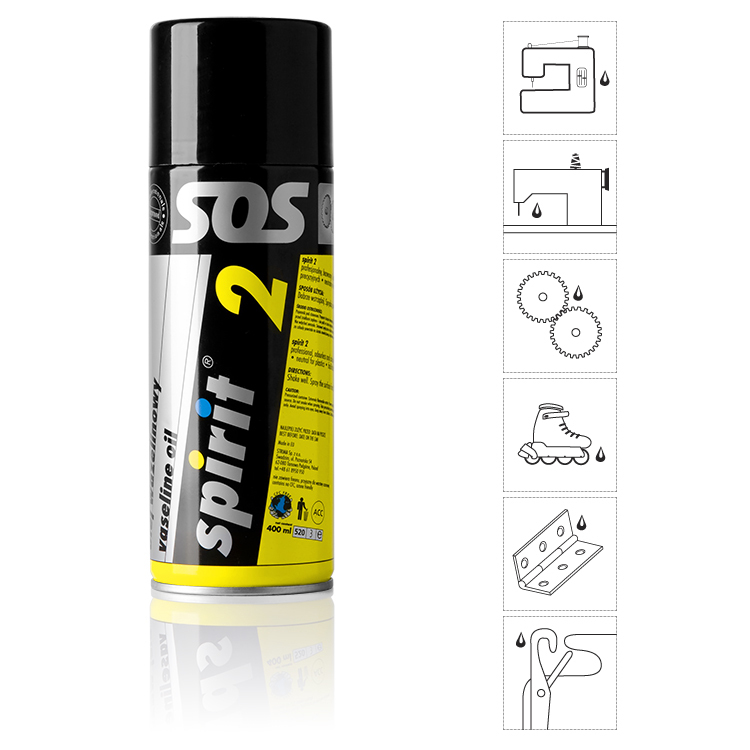 Spirit 3 extra is a non toxic, colourless and odourless silicone agent of higher density in relation to Spirit 3. Antielectrostatic. Facilitates slide. It prevents elements sticking. Does not grease or stain. It is especially helpful in plastics production - facilitates taking products out of the moulds; in textile industry - iron feet, vertical and band knives, work tables, presser feet, needles, slides of knitting machines. It precious in bookbinders'''''''''''''''' workshops and serigraphy. Perfect for jamming zippers, curtains rails, etc. 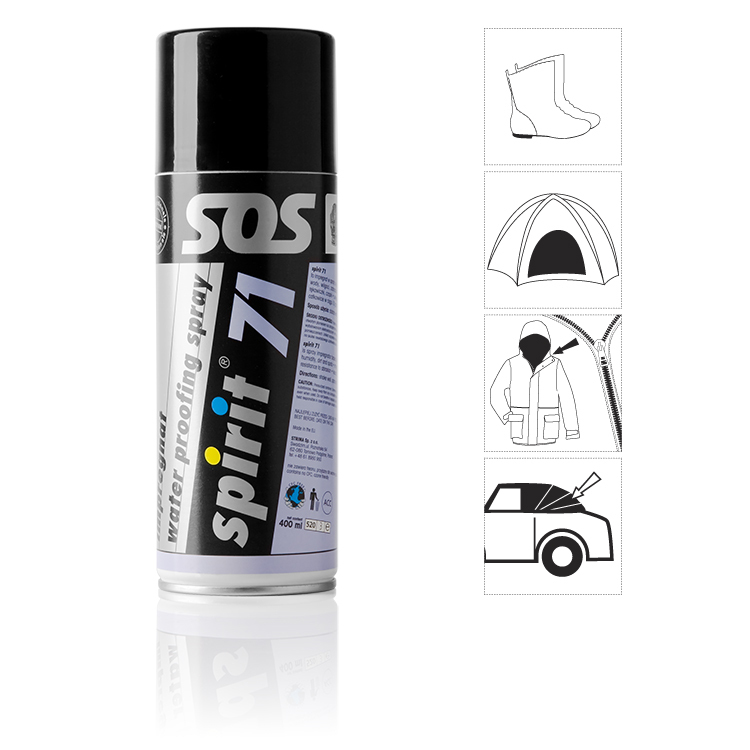 SPIRIT 37 is a silicone fluid modified especially for textile industry. Used for preparation of sewing thread and yarn, lubrication of knitting machines needles. It''''''''s colourless and odourless. It is used with brush, sprinkle or through immersion. Contains 1 litre. Spray for midlertidig vedhæng på stof, papir og plastic. Bruges også ved emblemer og broderier inden endelig fastgørelse. 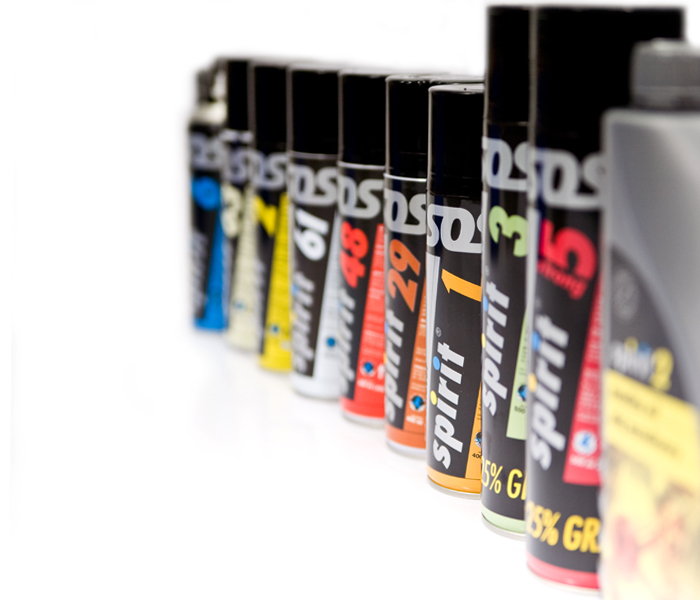 SPIRIT 5 is a pressure - sensitive adhesive spray facilitating multiple repositioning. It is used for temporary sticking of fabric, paper, light cardboards and plastics, films and cellophane to other surfaces. It enables multiple joining and separating of elements without risk of adhesive shifting from one surface to the other. It is widely used for textile industry for fastening of: embroidered elements of clothing [appliqués], patterns during cutting or drawing. It is indispensable in series production for fastening of elements before final mounting. It precious for artists [designing collages]. Attention! 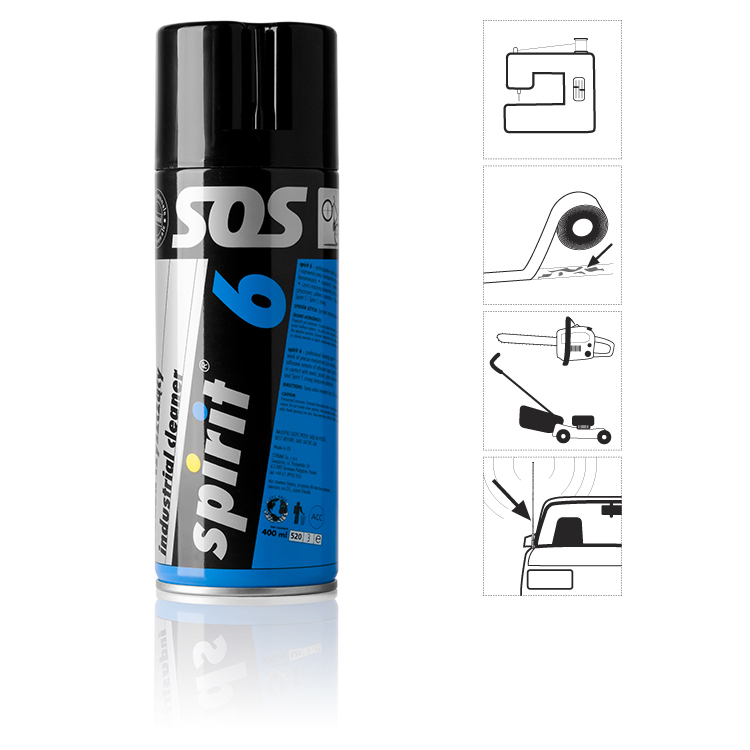 To remove used adhesive from machines and tools best apply the industrial cleaner SPIRIT 6. 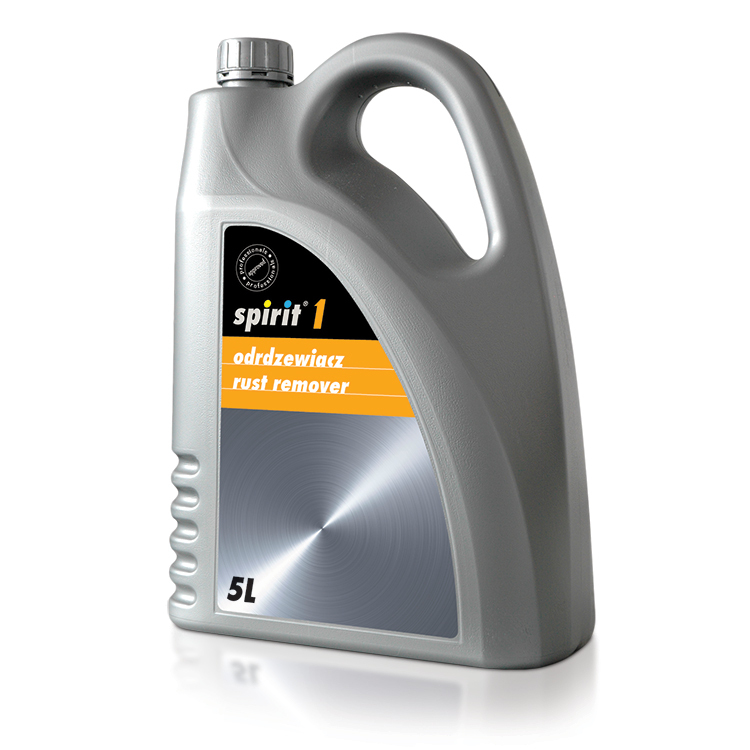 Spirit 6 is a professional, cleaning and degreasing agent. It facilitates removing dirt, oil, tar and adhesive remains from machines and tools. It derusts and rationalizes work of corroded mechanisms. Maintains. It is used among the others in: textile industry (embroidery workshops, serigraphy), machine industry (removes greasy dirt), varnish manufacture (removes remains of adhesive tapes). 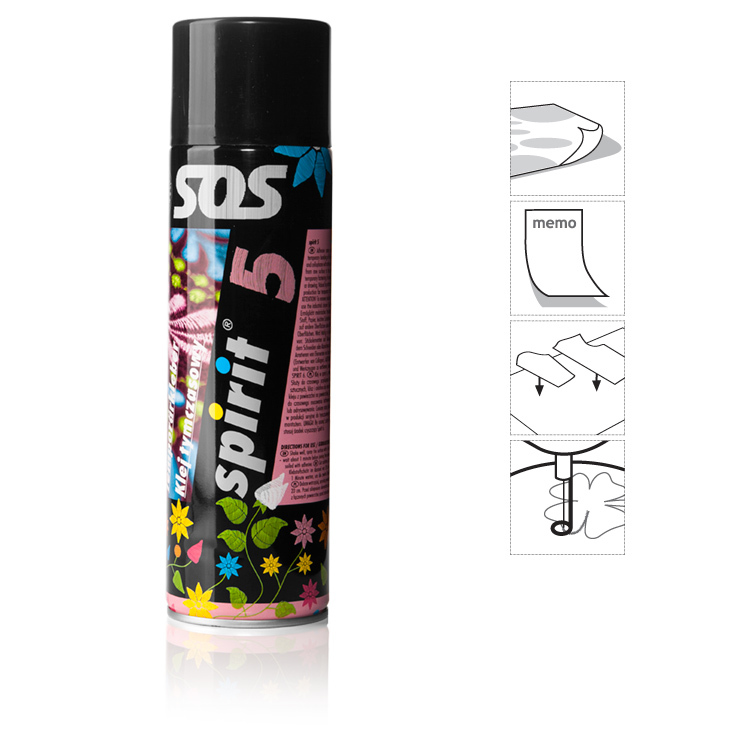 It removes the remains of used temporary adhesive Spirit 5 and Spirit 5 strong. 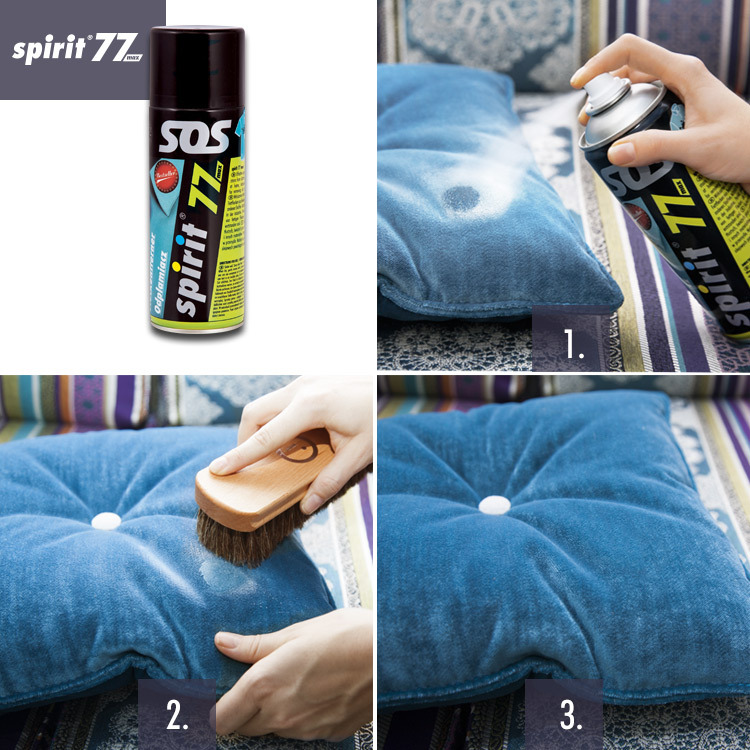 Spirit 77 MAX is an effective agent for removing greasy fresh spots on clothing, upholstery, carpets. Useful at home, indispensable in industry. Perfect for spot removing in clothing industry. 2. Spray spot from 15 cm distance. 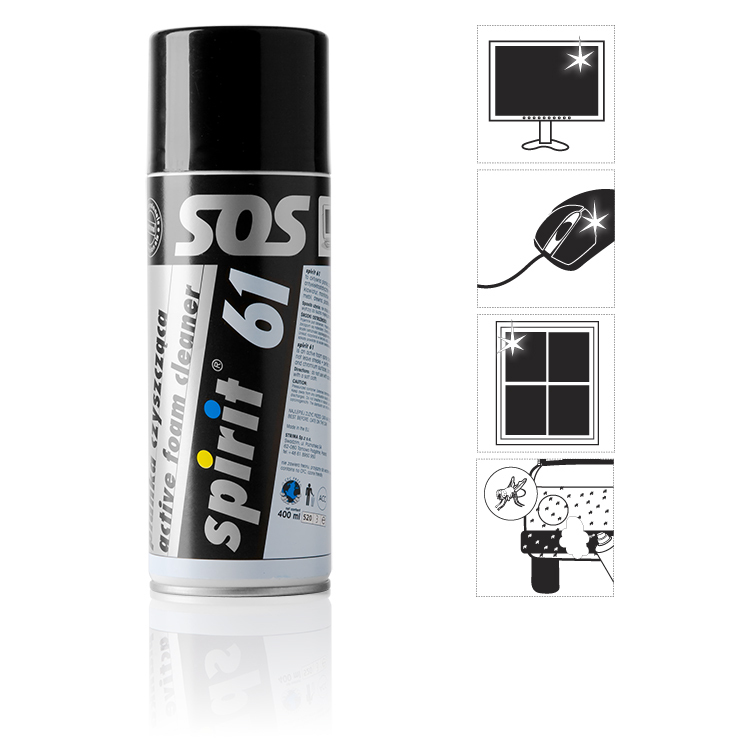 In industry - you can dry quickly using compressed air - SPIRIT 65, which simultaneously removes white powder. Before use make test on nearly visible place. Don''''t use with fur, leather and chamois leather. 3. I hjemmet vent flere minutter indtil pulveret bliver hvidt. Derefter brug en børste forsigtigt til at fjerne pulveret. I industrien - her kan anvendes trykluft til at tørre hurtigt. Er trykluft ikke til rådighed, kan SPIRIT 65 anvendes. 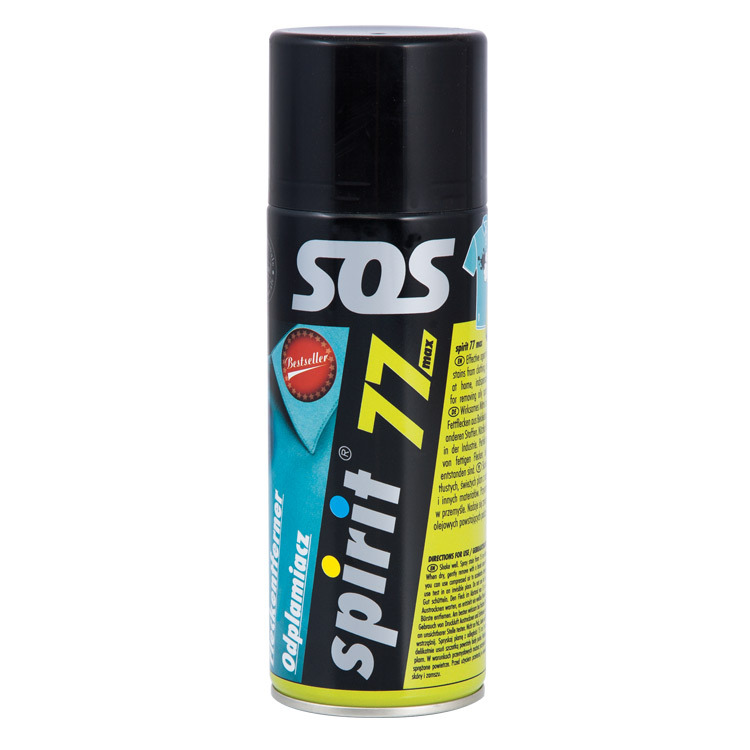 hvor SPIRIT 77 MAX pletjerner anvendes. keyboards, computers, cameras and other electric and electronic equipment. Imprægneringsmiddel til stof, læder og gummi. It protects fabric, leather and rubber from water, humidity, dirt and spots. It impregnates tents, bags, shoes, top clothes, gloves, hats. It increases leathers resistance to abrasion. Neutral in contact with colour. It polymerizes completely in 10 hours.